CHANDIGARH: An apparent truce has been declared between the BJP and Shiromani Akali Dal (SAD), after a meeting between BJP president Amit Shah and Akali Dal president Sukhbir Singh Badal was held in New Delhi. The SAD had threatened to snap ties with the BJP over the alleged interference of Rashtriya Sikh Sangat (an affiliate of Rashtriya Swayamsevak Sangh) in the Sikh religious affairs. The recent flashpoint was the amendment made in Section 11 of the Takht Sri Hazur Abchalnagar Sahib Board Nanded Act, 1956, allowing the Maharashtra government to increase its representation in the management of the gurdwara. The Akali Dal also called a core committee meeting of its party on Sunday to debate the issue of continuing their alliance with the BJP. Sources in both the Akali Dal and BJP confirmed that the two party presidents met for almost two hours. 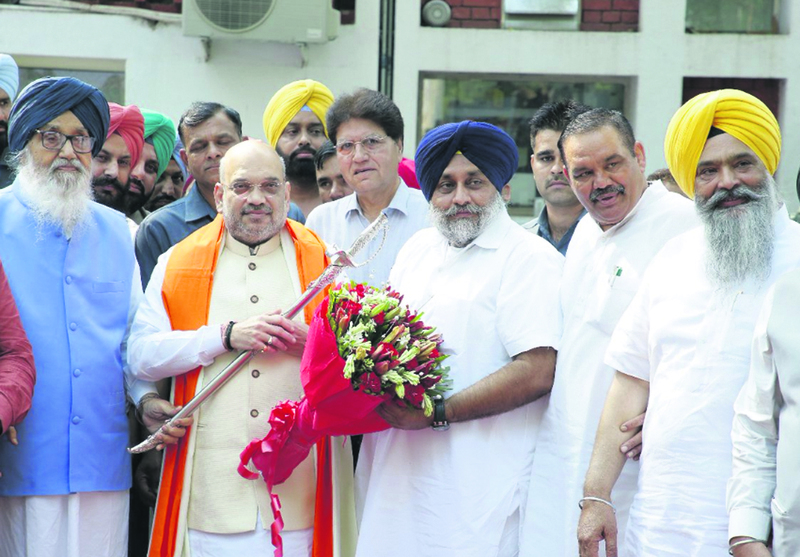 In the meeting, Shah reportedly assured Sukhbir that the amendment made in the Act would be withdrawn. One of the assurances was that the Rashtriya Sikh Sangat would not interfere in the affairs of the Sikhs. Both parties have agreed not to step on each other's political turfs, and Badal was assured that the Akalis would be consulted on all issues concerning Sikhs. Both, the Akali Dal and BJP have not enjoyed a very comfortable working relationship since 2014. While both the parties were in power till March 2017, the BJP-led government did not give any new project or succumb to any demand made by the Akali-BJP government of Parkash Singh Badal. However, with the Lok Sabha elections nearing, both allies seem to be working on their mutually beneficial electoral marriage. Snapping of ties over sensitive issue of the RSS infringing on Sikh religious institutions would also impact the BJP in northern states like Delhi, Haryana and Rajasthan, with sizeable Sikh voters. Sources have said both, Singh and Shah have agreed to hold a joint meeting with Akali Dal and BJP workers to have a joint strategy for the upcoming parliamentary elections. The meeting will be held later this month.